Finger sprain occurs when the ligaments in finger are injured. It's vital to reduce bleeding and swelling in the first 24 to 72 hours. Learn ways to treat it! A common injury that often happens while playing sports, especially ball games, is a sprained finger, which is an injury to the ligaments in the finger. Each finger is made up of three bones, known as phalanges, and two interphalangeal joints. These joints separate the bones from one another and allow your fingers to bend. Each joint has collateral ligaments that run along the side of them and connect the bones together. The thumb is made up differently, with just one joint and two bones, along with collateral ligaments. When any of the fingers is bent in a way causing damage to the ligaments, it will lead to finger sprain. A finger sprain often occurs when your finger bends backwards or sideways while playing sports, resulting in injury. During ball sports, your finger may be bent forcefully during a specific incident. While boxing or martial arts, it can occur as a result of delivering an awkward or forceful punch, or when tackling or colliding with someone else. You may also suffer a sprained finger by overusing your finger doing repetitive tasks. It is important to treat a finger sprain within the first 24-72 hours in order to minimize bleeding, inflammation and swelling. In order to promote healing and reduce pain and swelling of the ligament in your finger , it is important to avoid using the injured finger. One way to keep it immobilized is to wear a splint or tape the injured finger to the one next to it. Avoid activities that place excessive pressure on your finger, such as lifting heavy objects. Ask your doctor about the best way to rest your finger and keep from using it. Applying ice is a good treatment as it helps to reduce swelling and relieves pain. Be sure to avoid placing ice directly on the skin. Wrap ice or an ice pack in a towel and apply to your finger every 10-20 minutes, 4 times daily, until the pain and swelling have subsided. It is especially important to use ice within the first 48 hours after suffering a finger sprain. Using a compression bandage, especially during the first 24-72 hours, on your sprained finger helps to keep it immobilized and reduce swelling. Make sure that the bandage is not wrapped too tightly or else it may cut off blood circulation. The best way to bandage and compress your injured finger is to wrap it along with the finger beside it using 8-9 inch tape. This will promote healing of the ligament and keep your finger immobilized. 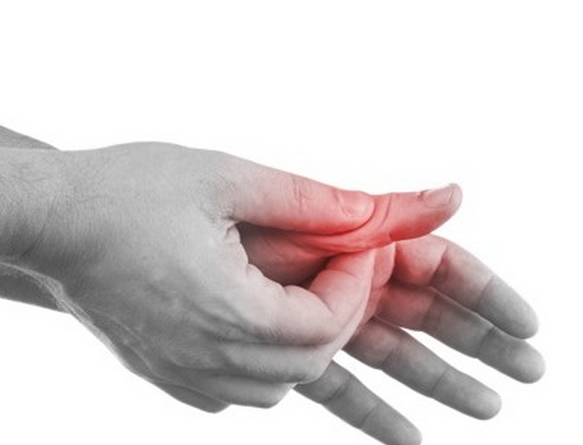 After proper treatment, a sprained finger usually gets better after 1-2 weeks. At this stage, performing the following exercises three times a day can help to heal the sprain. Concult with your physiotherapist before trying them to make sure they are suitable for you. Do not continue doing them if your symptoms get worse. Make a tight fist by curling your fingers and thumb as tightly as you are able to without experiencing pain. Then release and do again. Repeat this exercise 10 times. Beginning with your hand straight and your fingers together, spread your fingers as far apart as you can without experiencing pain. Place your fingers back together. Repeat it 10 times. Hold a tennis ball in your hand, and squeeze it as hard as you can without feeling pain. Hold the ball for 5 seconds. Repeat this 10 times. After a mild to moderate finger sprain, you can usually resume your normal activity level after 2-6 weeks if you maintain recommended treatment and management of your injury. If your sprain is more serious, it will take longer for your finger to heal. In some cases, severe finger sprains may cause joint swelling for several months. You may also be at slightly higher risk of developing osteoarthritis depending on what joint has been affected and how severe the injury is. It is a good idea to discuss this possibility with your doctor. Although treatment is similar, finger dislocation is a more serious injury than a sprain. When finger dislocation occurs, the joint alignment is altered, and the joint capsule and ligaments are torn. The joint itself needs to be put back to where it was prior to the injury. The majority of dislocated finger injuries can be treated with a splint, which realigns the joint and promotes healing of the ligaments and joint capsule. Ice and elevation should also be performed in order to reduce swelling, inflammation and pain. After realigning the joint, your doctor may order an x-ray to ensure that the joint is back in the correct position and to check for a possible fracture. In some cases, surgery may be required in order to repair and heal the injury. Your doctor may also recommend other methods concerning treatment of the dislocated joint.